Here’s yet another amazing TED talk to inspire you to see things differently. I can’t remember the last time Andrea went away for the weekend which means her getaway to Toronto is long overdue. It’s just Lucy, Bayla and me. There’s lots of fun things to do this weekend. However, like most weekends in our house, they have accumulated a mess that needs to be cleaned up before anything else can happen. I’m really hoping they can tackle the backlog tonight so we can enjoy the rest of the weekend with no pressure. By the way, we pulled together a short video about Sylvester last night. Here it is. We created a short documentary video celebrating Andrea’s last fast track bloodwork appointment and breast cancer chemotherapy treatment. The video includes reflections on the six months that got us where we are, the chemo process and the jarring “klunk” of The Bell of Hope. 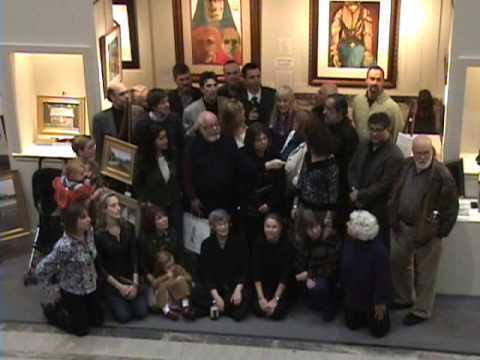 Our friend author Richard Michelson arranged and sent us this amazing video Get Well message which was filmed on November 8, 2009 during the 20th Annual Children’s Illustration Show at the Richard Michelson gallery. The video features an incredible gathering of authors and illustrators sending get well soon wishes to me. How cool is that?! A huge Thank you to everyone who beamed us these good wishes and to Richard for the beautiful sentiment. We missed you this year and we’ll be there for sure in 2010! We prepared this short video of clips from Andrea’s head shaving party and some thoughts that we live by every day.